2011 US SENIOR NATIONALS HOSTED BY NORTH CAROLINA BADMINTON CLUB! USA Badminton, the Southern Badminton Association, and the North Carolina Badminton Club (NCBC) are pleased to announce the 2011 US Senior National Badminton Championships will be hosted by NCBC. After almost 70 years, a USA Badminton-sanctioned National Championship event returns to Raleigh/Durham, NC! In 1942, North Carolina Governor J. Melville Broughton opened the Sixth Annual United States Badminton Championships when almost 300 players competed at Duke University. Dinner: Be sure to take part Saturday night in a delightful dining experience featuring a ‘live band’ playing North Carolina mountain music! 2011 SENIOR NATIONALS-10 MORE REASONS TO COME! 12. You can visit Duke University where the last USA Badminton National event in North Carolina was held in 1942. In case you weren’t there, Dave Freeman dominated, and yes, courtesy of Duke U archives, we have the original draws. 13. Visit the site of the 1942 Rose Bowl (yes, it was once held away from Pasadena, CA). Who won? 14. Try and keep players from the Southern Badminton Association from dominating the podium. 15. See if Jim Greenlees (a great National Umpire from Charlotte) can play as well as he umpires. 16. A registration of 150 plus is anticipated. 17. The 2011 Senior Nationals are a qualifying event for the World Masters Games – Fall 2011 in Canada. 20. Find out why many badminton player spouses choose NOT to accompany them to tournaments. Think the fees are high for this event? 1. Many previous events did NOT include airport pickup and return transportation. 2. Many previous events did NOT include transportation to and from the play venue. 3. Hotel cost for Senior National events in previous years has been $99-119. The hotel cost for this event is $59 double, $69 triple/quad, and INCLUDES a hot breakfast. 4. When was the last time you attended an event banquet for $25 where there was a live band? 5. Yonex 50 shuttles will be used and are included in the fee. This is the best shuttle for tournament play and is used in many world-class events. Have questions or comments about this? E-mail or call the USA Badminton 2011 Senior Nationals Tournament Hotline at 336-234-9761. LOVE BADMINTON – SHARE THE LOVE! How? Support Junior Player Development by recruiting competitive juniors, sponsoring a junior for an awesome International Training Camp experience sanctioned by USA Badminton, or go to camp yourself! Why? The primary goal is to give elite juniors the opportunity to broaden their experience by training with a top European Junior National Team Coach and Danish competitive junior players. Who is coaching? Head Coach Dennis Christensen, currently working with the Junior National Team in Denmark and formerly the Head Coach of the Swiss Junior National Team, conducts camps and clinics worldwide. He will be assisted by one or more Danish highly ranked player/coaches and up to ten Danish competitive junior players! Who are the players? Current and ‘wannabee’ competitive junior & adult players – Coach Dennis knows how to bring out the best in a player of any skill level or age. A separate section is reserved for training or competitive adults who would like to better their game. Don’t worry, Coach Dennis understands the physical limits of aging bodies and will organize training sessions to incorporate mental and physical aspects of the game. Past camp participants have been from Florida, Massachusetts, North Carolina, Ohio, Washington, Canada, Switzerland, and Denmark. What is the focus? Technical skills, singles/doubles tactics, offensive/defensive skills, footwork, conditioning and competitive game play. Players’ skills will be assessed, groupings made by the coaching staff, and players will receive individual instruction based on those assessments in order to help each player reach their full potential by building upon current skills. Players will work hard, be tired at the end of each day, and have lots of fun while improving their game! There is a Bonus? Friday & Saturday, July 29th/30th following the camp, NCBC will host the annual NC Open Tournament with Open, Junior and Senior categories – a chance to put to use what was learned during the camp! Juniors or adults will have a chance to compete against Danish junior players, if desired. How can you help? *Recruit competitive players * Sponsor a Junior * Go to camp yourself! The custom at many Senior tournaments, particularly the U.S. Senior Nationals and the Graham-Toms Senior International held in Miami, is a dinner usually held on the final night of the tournament. This gives players an opportunity for food and camaraderie, and brings everyone together for special awards and thank-you’s. In recent years, some players have opted to skip the dinner. Tournament hosts need direction in planning for future tournaments. Should a dinner continue to be offered? If so, is there another program format that would make this event more representative of those who attend? Is there another option for bringing tournament attendees together? When would awards be presented? Do these awards remain meaningful? Are there other options? We need your opinion and suggestions. Please give this some thought and e-mail Andrea Weiss, [email protected], Senior Advisory Group Co-Chair, with your comments. Like most badminton players from my generation, I grew up playing my favorite sport in mostly unavailable school gyms. This reliance on school gyms became even more difficult after the inception of Title 9. With Title 9, school gyms became even more difficult to get. So like a lot of you out there, I dreamed of having a badminton gym. Then after several failed attempts at building a club from the ground up, I went to pick up my son at school one day from a high school badminton tournament. As I walked into the gym, I saw over 150 high schoolers playing or waiting to play. As I left, it made me give building a gym one more shot. I found a warehouse close by and compromised my ceiling requirements and made an offer on the spot for a gym that would fit five courts. At the time, I had no idea how I was going to afford the gym. Seattle has a good history of badminton and a lot of players came together to help fund and build the gym. We were fortunate we had excellent construction talent with Chris Gulin, and we all chipped in to build out the space. Our mission statement for the club is to introduce as many people and youth to a sport that offers the benefit of keeping people fit for a lifetime, and form a sense of community around a sport we all have in common. As a result, we have a healthy junior program with coaching a big part of our club. With classes for all levels of juniors and adults, we now have over 150 juniors of all ages and skill levels. Now in our fifth year, we have 11 courts and plans for more. We also have men’s and women’s club leagues to keep players active. The next phase I see for badminton in the U.S. is to find ways to keep people active in playing. We have learned players need structure, goals and community to keep playing. Based on this, we are looking to focus more on ladders and leagues and having club exchanges in the coming years. We look to have a rating system in place locally to help players match up with other players of the same skill set which is so important to fully enjoy playing badminton as with any racket sport. Creating this type of environment is the next step for badminton to mature into a sport on par with the other racket sports played in the U.S. So if you or your current club wants to take that first step to building a facility, feel free to contact me and we will help you get started. It takes a lot of effort but done properly, it can be done with very little cost and will return to you a great deal of satisfaction that you have built something a lot of people will enjoy. Check us out at our web site at Bellevuebadminton.com and contact us if you are looking to play in the Seattle area any time. See you on the courts!!! Some really odd-ball records were set at the 17th edition of the Jerry Toms Senior International in Miami Lakes, Florida from January 10 to 15. Nothing was too unusual about the 110 participants from 9 countries, except that 6 participants were from Costa Rica, a first time. Collin Taylor signed up for six events, hoping to play a lot. With the last minute cancellations by several players, Collin stepped up to help fill the missing partners adding another three events. By the end of the week he had logged a monstrous 10 hours and 38 minutes of court time, almost double the previous set in 2008 by Helene Dube. “Yes, I am a wee bit tired.” He won the Superman Award. Canadian Claude Lambert also accomplished a dubious feat. He served soooo far wide that the shuttle hit a player on another court. At the banquet his accomplishment was noted and he was awarded a new racket without strings so he would be unable to duplicate this in the future. In 35 men’s singles Aphiratphong Rattanasatian racked up the first win by a Thai national in this tournament, but fell one letter short of matching the name length of a previous winner, Channarong Ratanaseangsuang, who played for Canada. The prestigious Kelly Tibbetts and Bill Graham Awards for Sportsmanship were won by Margie Uyeda and Guy Tetreault, both from Canada. Margie’s husband, Tosh, won the award back in 2007, making them the first husband and wife winners. Begun in 1985 the Jerry Toms Senior International is now history, being replaced by the Graham-Toms Senior International. With the passing of Bill Graham 2 years ago the Toms family and the Graham family felt it only appropriate that these two lifelong friends be ever linked to this annual tournament. So next year mark your calendar, “Sun, Golf, Badminton”, January 10 to 14–different name, same great tournament. The badminton community was saddened by the passing of Bob Lewis on Wednesday, Jan. 12, 2011, at the age of 82 at his home in La Crescenta, CA. He was a player for the last 17 years, a USAB Line Judge and the Assistant Line Judge Coordinator for the U.S Open. He was also one of the coordinators for both the Burbank Badminton Club and Glendale Badminton Club, the Administrative Vice President of the SCBA, and was also in charge of venue development. Bob’s integrity and enthusiasm for life and the sport of badminton will be sorely missed by all who knew and loved him. Bob was one of those truly gracious individuals who made life so much more pleasant for everyone around him. A memorial service was held January 27 at Descanso Gardens in La Canada. places as far away as Canada. about exercise, it is all about playing and spending some good times with your friends. Check out the Badminton Results from the 2010 Huntsman World Senior Games at http://www.seniorgames.net/results/badminton/ Thanks to Joyce Jones for sending the link and congratulations to Joyce and all the winners at the games! The Ann Arbor (Washtenaw County, Michigan) Recreation center held another successful tournament on October 16-17, 2010. This event, which is ably run by Dan Mehr, features both Open and Senior brackets in an ABCD format. Despite the fact the University of Michigan had a home football game on Saturday (attendance 103,000 plus) I had no trouble with traffic whatsoever even though we stayed in Ann Arbor for dinner on Saturday after completing play. Trophies and T shirts were provided and the event was enhanced by the presence of Louisville Badminton Supply. I can recommend this as a happy and pleasant way to spend a weekend next fall. Results are below. FABULOUS FACILITY OPENS DOORS IN METROPOLITAN BOSTON! The Boston Badminton Club has opened! This newly built facility has been constructed specifically for badminton with 8 dedicated badminton courts fully conforming to Pan Am Badminton’s competition regulations. In addition to becoming the premier private club for badminton in New England, it is already planning to host a wide range of tournaments locally as well as nationally and internationally. Every aspect of the club has been planned with great care and quality from its physical layout, construction, membership, coaching, location, program scheduling and overall club management. The building is well insulated with full heating and air conditioning to allow for comfortable year-round play. The efficient ventilation system is specially designed so as to provide uniform temperature control for the entire facility with no drafts on court. Lighting is properly spaced for all courts. Court surface is a Robbins Bio channel classic maple sports floor as used by eight of the Ivy League schools and numerous New England private schools for their competition sports. The club also owns four top quality badminton mats intended for use in its elite tournaments. Facilities also include full locker and shower rooms, kitchen, pro shop offering a full line of Yonex and Li Ning equipment and clothing, excellent spectator space and on-site parking for 56 vehicles. Boston Badminton (BosBAD) offers a flexible membership structure with premier and restricted memberships in addition to walk-in passes. The premier membership provides court access 24/7 as well as discounts for its Pro Shop and lessons and other programs. Head Coach is Thomas Indratjaja of Indonesia who has top level international playing experience having reached quarterfinals or better in tournaments in Indonesia, Denmark, Australia, Thailand, United States, Singapore and Germany in the late 80’s and early 90’s. Since then he has been employed as a coach rising within top clubs in Jakarta, Malaysia and Dubai to Head Coach at the Tangkas Alfamart Club in Jakarta and most recently as Assistant Coach at the Indonesian National Training Center (2006-2010). Among his players have been Deyana Lomban, Marissa Vita, Hendra Gunawan, Nova Widianto, Markis Kido, Hendra Setiawan and Maria Kristin Yulianti. Thomas is moving to Massachusetts with his wife and two children. BosBAD is in Westborough, MA, a suburb just west of Boston and is easily accessible by car because it is ideally located just off of Interstate 495, one exit from I-90 (MassPike). In addition, it is almost equidistant from Boston’s Logan International Airport, TF Green Airport in Providence, RI, Manchester International Airport in southern New Hampshire and Bradley International Airport in Hartford, CT, all of which can typically be reached in an hour or less which will provide many options for those traveling from out of state. Thirty-six juniors from eight states took their winter holiday vacation in Westborough, Massachusetts, attending the YONEX/USBEF Competitive Training Camp during the week between Christmas and New Year’s. 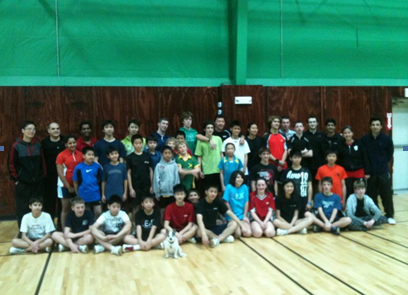 The brand spanking new Boston Badminton Club hosted the camp with six coaches working under the supervision of National Coach Andy Chong. This was the very first event to be held at Boston Badminton (BosBAD) having just received its occupancy permit from the town of Westborough on December 23, 2010. The camp had been planned to start on Monday, December 27; however Mother Nature brought a present of a foot or so of snow to the Northeast that day causing a one-day delay for the start, shortening the camp to just four days. BosBAD’s eight-court facility proved to be a great success in all regards. While the weather outside was frightful, the athletes and their parents were comfortable and well taken care of inside. Andy quickly adjusted his original plan to fit the reduced timeframe, organizing the players into different groups according to skill levels to work with different coaches. Assisting Andy were Ajit Umrani, Paula Obanana, Pashupati Paneru, Nick Vered, Desmond Wong and Sasha Boyarin, all USAB accredited coaches. Refreshments and lunches were provided daily by the club with some of the cost underwritten by the Massachusetts Badminton Association (MASSBad). USBEF’s grant money allowed several participants in need of financial assistance to attend at reduced rate and also helped with the coach compensation. Yonex provided shuttles, shirts and some equipment. Participating in the camp were: Massachusetts: Clayton Cayen, Nathaniel Cayen, Alex Cheng, Lee Chern, Min Chern, Chris Colcord, Sophie Deutsch, Philip Donlon, Nicole Frevold, Sang Hyub Lee, Chun Lok Lo, Christopher Rodts, Johathan Shee, Timothy Shee, Alan Shekhtman, Clark Uhl, Thornton Uhl, Nicholas Waller, and Peter Waller; Maryland: Eliot Bohr, Kenneth Bohr, Rachel Liao, Sam Phimphachanh, and Victor Phimphachanh; North Carolina: Abhay Qureshi and Neo Vasudera; New Jersey: Raymond Chen; New York: Anson Cheung, Michael Pierides, William Tan, and Victor Wong; Ohio: Amelia Lee and Preston Lee; Pennsylvania: Peter Thai and Zak Miller; and Virginia: Aarthi Prakash. • A few years ago, I personally got into a needless little “kerfuffle” with the President of the Southern Badminton Association. I was looking at the needs of only our club in North Carolina and he was looking at the needs of the SBA. Mike Gamez died before we had the opportunity to reconcile our differences. • Washington, D.C., has more civil servants per capita than any other state in the country, but does this mean that D.C. knows more about governing the country? Rhode Island may have more players per square mile than any other state, and California may have more players per capita than any other state but neither of these statistics can mean that we ignore the opinions of Maine, Missouri, New Mexico, South Carolina, or any other location. • Total membership of USA Badminton is less than 1% of the playing population. In fact, it may be even less than .5%. What do we DO to change this? I was discussing some of these thoughts with a badminton friend of mine, and I asked her why badminton is so political. Her answer was that ALL sports are political. Maybe this IS a political disease that we should vaccinate ourselves against. So…assuming that the above issues are problems needing solutions, what might these solutions be? How about these? Let’s all be more civil to each other and maybe our politicians will do the same. • If you play badminton 20 hours a month, spend at least 2 hours each month building the sport. • Remember that whether you live in a “Badminton Wasteland” part of the country or a “Badminton Mecca,” your opinion should still count, and with today’s technology you can still be a “do-er.” Mecca needs Wasteland and Wasteland needs Mecca. Civility CAN be an ingredient of getting things done for badminton. People don’t remember what you say or what you do…they remember how you make them feel. Let’s make everybody feel good about badminton, our organizations, and our leaders, and then they WILL want to work together to build this wonderful sport.